120 sachets will provide you with the extra sachets to keep in your car, at home, the gym, work or anywhere else you are drinking water. If you have a spouse that you would like to use this product with, this is the most cost effective way to purchase the sachets. This will provide you and your partner two fresh sachets daily. Why Sango Coral Life Okinawa coral? A natural abundance of minerals – Coral harvested from coral sands under the sea contain calcium and magnesium, together with other trace elements including potassium and zinc. in a natural balance. We call it coral calcium because calcium is the highest concentration of mineral that is present. For good health, our bodies depend on minerals to be present in a specific, natural balance. A superb natural filter – Coral is a fabulous filter, created by nature and time. When water is filtered through coral, it becomes clear, fresh and delicious. A 1-micron (1/1000 millimeter) view of coral under an electron microscope highlights how its porous nature gives it a large surface area, a feature which cannot be reproduced artificially. During its lifecycle, coral produces oxygen and its filtering action naturally contributes to a clean ocean, which is why the water in coral reefs is often so clear. Coral may provide many of these same filtering benefits to water we drink. Coral is a true natural mineral supplement. The collecting of this coral uses gravel mining techniques that have been adapted to ensure the safety of the coral beds. The harvesting and processing of Sango Coral Life is performed under the strict guidelines of the Japan Ministry of Land, Infrastructure, Transport and Tourism and the Fishery Coordination of Okinawa Prefecture. 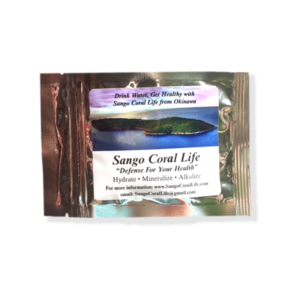 The coral used for Sango Coral Life sachets comes from the sea of Okinawa. This sea is recognized as one of the cleanest in the world, with no concerns regarding contamination. Five times as many Okinawans live to be 100 compared to the rest of Japan. The Japanese are the longest lived nationality in the world. The Okinawans not only have the longest life expectancy but also the greatest health expectancy. Their secret behind their longevity and the low incidence of chronic disease is thought to be a blend of lifestyle, genetics and lifestyle which includes the use of this coral. 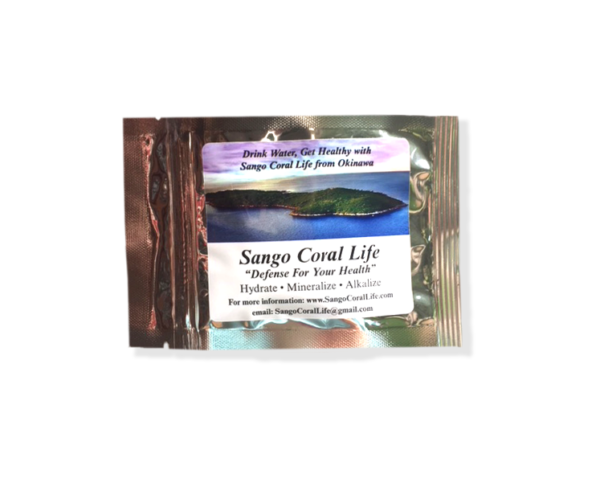 Sango Coral Life is a small sachet or teabag that is dropped into your drinking water. It is then stirred or shaken, depending on your container. Your pH of your water is immediately increased along with 70 + trace minerals ready for your intake. Reuse the sachets for a mineral bath or to add minerals to the soil in your garden or plants. The coral used in our sachets are the purest coral available on the market. Strict regulated guidelines are enforced as not to damage our natural seas along with the harvesting process. We have silver added to protect against bacteria. It is also a well known fact that the Japanese people live a very long time with a high quality of health. This culture of the Sango Coral is taught from a very early age in Japan. As we battle many disease processes here in our country, we are being forced to look at alternative ways to not only keep our health but to improve our health. This 100% all natural coral has no side effects, is very affordable and may even lower your healthcare costs due to your body becoming alkaline and ridding itself of the acidity that is built up in our bodies due to our lifestyles. There are 72 trace minerals that are distributed into your drinking water that will be absorbed by your bodily cells upon ingesting. This is the best way to administer these minerals–immediate and effective. No waiting on capsules to be absorbed or passed through your body. Recommended usage: One sachet may be used in a bottle or glass of water twice. Always remove the prior-used sachet from your container when applying a fresh sachet to your water. You may determine your usage of sachets by the water you drink. One may start with 2 or 3 sachets daily (4-6 bottles of water) and decrease this once you have determined your body has reached an alkaline state. If you have questions on how to make this determination, please feel free to contact us. Copyright © 2019 Sango Coral Life. All Rights Reserved.